Arms dealer. Owed his cousin Quark a shuttle. Made good on his debt, but booby-trapped the ship. Involved with Hagath. Helped rescue Ishka from the Dominion. 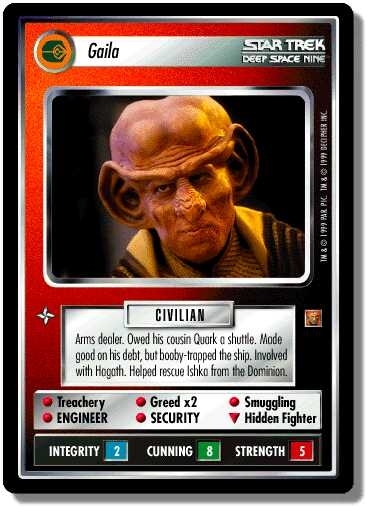 Characteristics: "Reshape the Quadrant"-related cards, affiliation, Arms dealer, "Quark"-related personnel, Ferengi species, matching commander. There are 29 entries for Gaila (ST1E 8 R+ 75) at the Tradeplace (22 haves and 15 wants). Click here to see all trade list entries for this Rare Plus card!